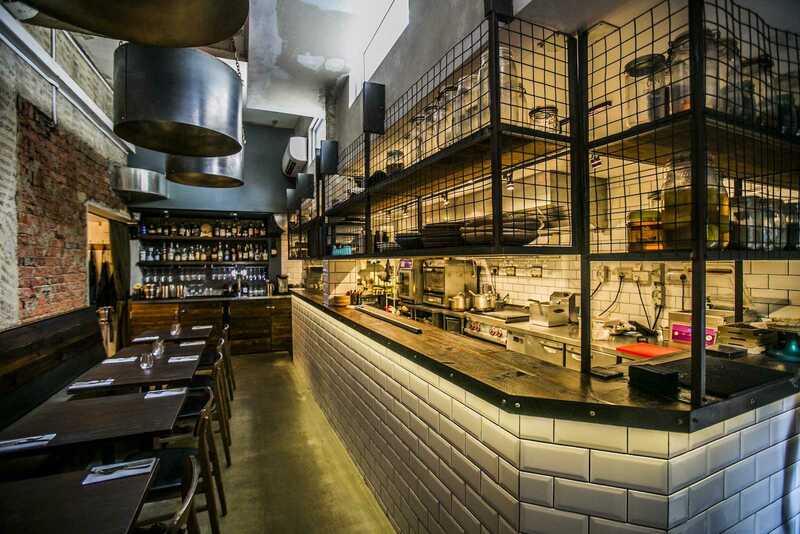 Grungy, underground and darkly chic, Maggie Joan's has proven it's not a hipster destination that can't last a year. It just celebrated its third anniversary last year with a new menu designed by promising young chef Seumas Smith. Formerly Head Chef at Moosehead, he has taken on the role of Group Executive Chef and now fronts the kitchen at Maggie Joan’s. The focus remains Modern European, and the dishes are executed with flair and skill, but remain approachable. Still, it's intriguing learning about the ingredients and techniques used here. 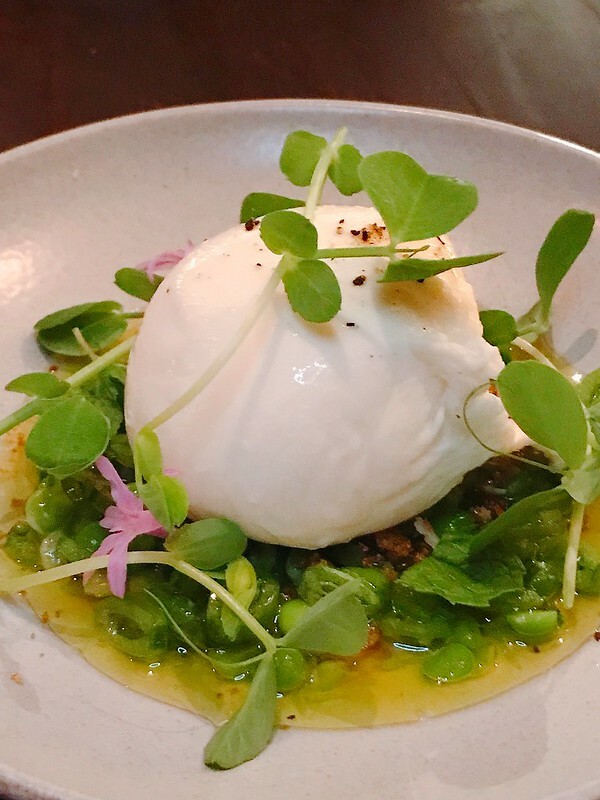 While the philosophy behind Maggie Joan's (named after owner Daniel Ballis' two grandmothers Maggie and Joan) is to make food as much as possible from scratch (just like grandmas would), the final delivery is certainly far more refined than granny's rustic fare. 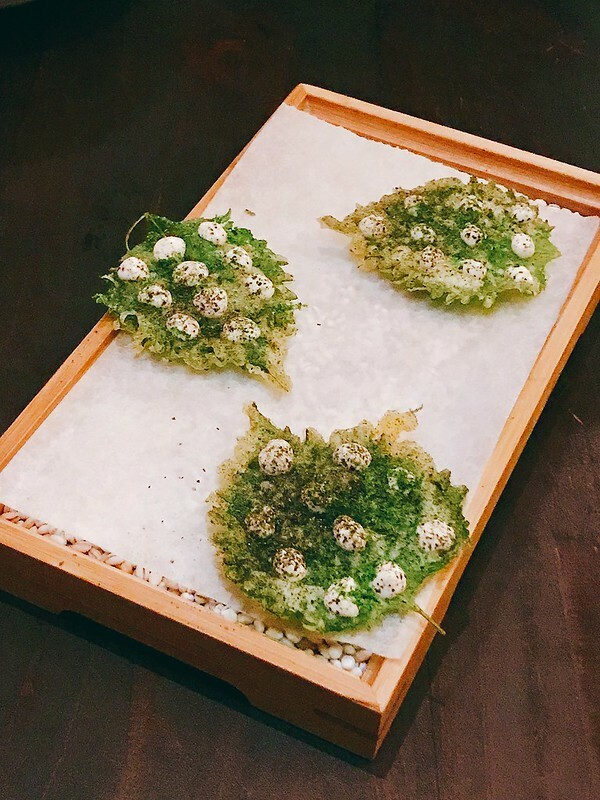 Fresh shiso leaf is coated with a wet tempura batter and deep fried till crispy and light. Little pearls of taramasalata dot the leaves; the blend of mentaiko, sourdough bread, garlic, olive oil and lemon juice are the perfect dressing for the crispy pungent leaves. Another garden-like creation, this time featuring Japanese hamachi thinly sliced and seasoned a la minute with salt, pepper, olive oil and lemon juice. Those little pieces of wakame (seaweed) are pickled with white wine vinegar, black mustard seed, star anise, clove, bay leaves and bay leaves for a minimum of two days. 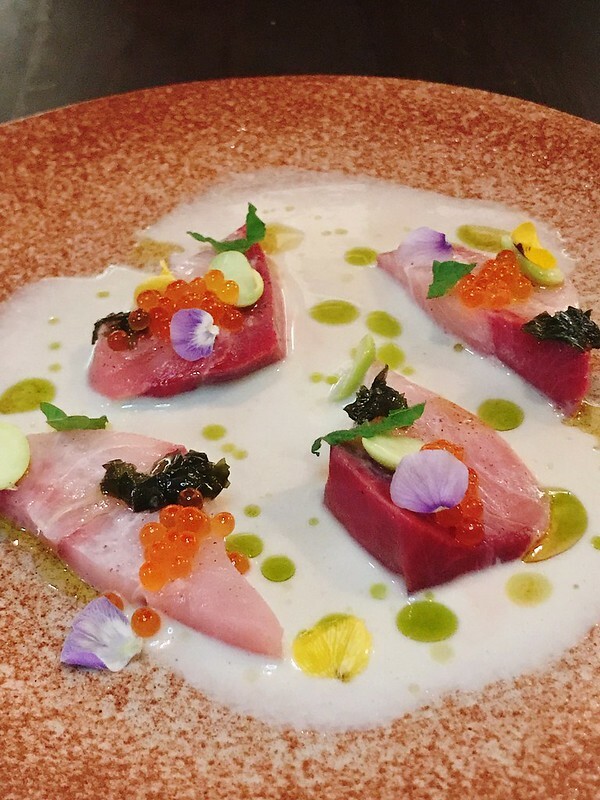 The hamachi is placed in an almond sauce which has a touch of chardonnay vinegar, buttermilk and green grapes. Together with the mirin and soy marinated trout roe, it's definitely a pleasing combination. Sliced English snap peas and Australian garden peas (skin removed!) are combined in a dressing made with lemons preserved in brine and pickled with chardonnay vinegar and sugar. The ensemble tastes strongly vegetal but is perked up by crispy sourdough breadcrumbs sauteed with butter, rosemary, thyme and garlic. 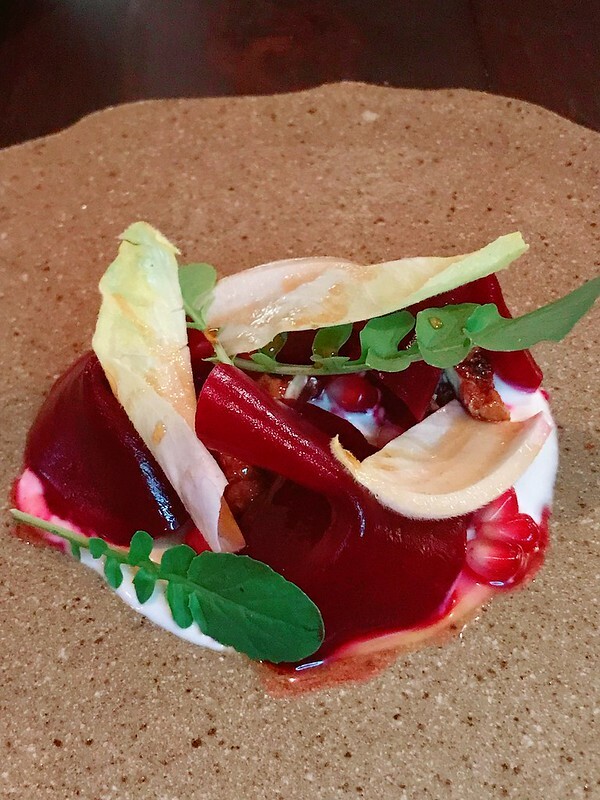 Australian beetroot is done two ways - barbecued in the INKA charcoal oven and pickled in a solution of red wine vinegar, wine and sugar for a minimum of two days. The French crème fraiche is smoked in the INKA oven over hickory wood chips, and seasoned with Scottish heather honey from Prince Charles’ Mey Selections, which sources ingredients and products from within 150 miles of the Castle of Mey. Wow. The humble carrot never tasted so different and divine! These are confit in butter with bay leaf, thyme, rosemary, salt and sugar. Then they are grilled in an INKA charcoal oven upon order, tossed in brown butter, black sesame seeds, parsley and honey. Even the ricotta and apricot puree are made in-house. 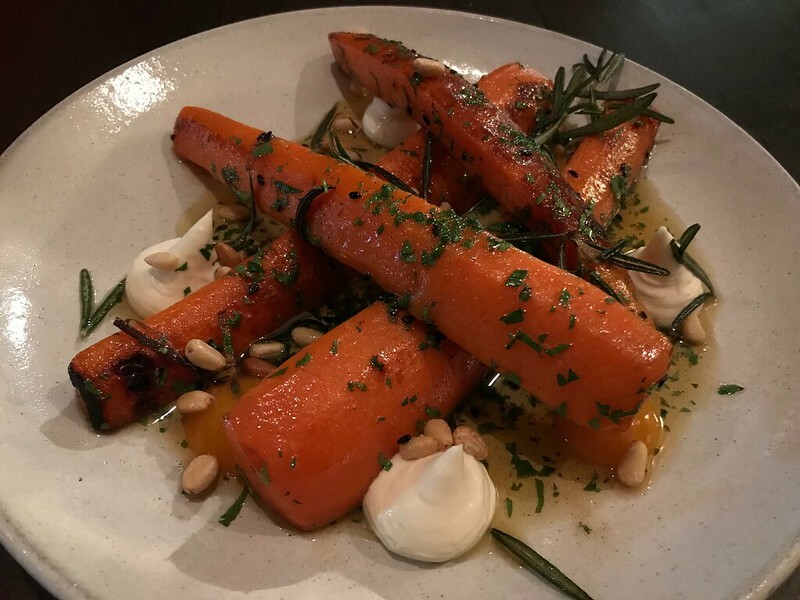 But the confit carrots really steal the show with their buttery soft texture. - Local barramundi is pan-seared till skin is crispy, then finished in the oven. - Sustainably farmed mussels (caught off the coast of Chef Seumas' hometown in Scotland) are sauteed in a very hot pan. 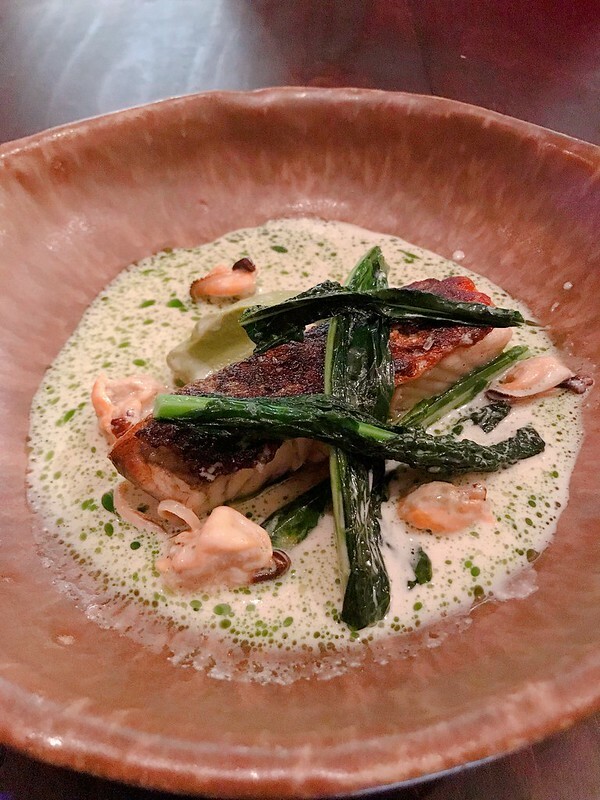 - Nage is a fish and vegetable stock broth with thyme, sauteed shallots and garlic, white wine and cream. - Cavelo Nero (black cabbage or Tuscan kale) is lightly sauteed with olive oil. - Parsley oil is made by blending parsley and corn oil in a Thermomix at low heat to extract the bright green chlorophyll. - Salmorejo, a sauce of tomatoes, garlic, basil, sourdough bread and olive oil. - Salsa verde made from a blend of mint, parsley, basil, capers, gherkins, dijon mustard, white wine vinegar, olive oil and salt. - Chinese black garlic is blanched seven times to take away the rawness, cooked in milk till soft, then pureed. And at the top, a little lamb bun! The filling inside the bread roll is confit lamb belly and braised shoulder mixed with chopped parsley and thyme. I say they should really sell this on its own. Spanish Duroc pork is famously tender thanks to its fat marbling. The pigs are born and bred in small farms, and fed on olives. 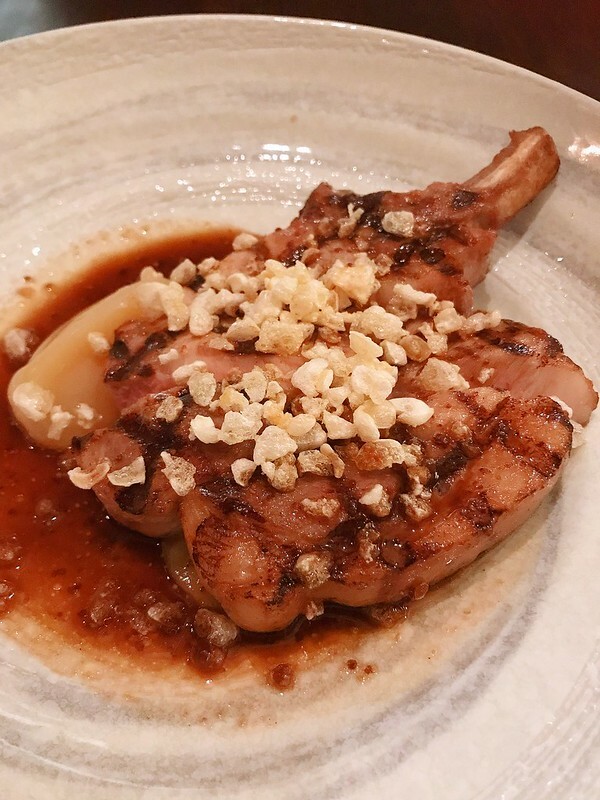 The pork chop is seasoned and grilled in the charcoal oven, and finished in the oven. Apple puree and puffed pork crackling add contrasting flavour and texture. Finally, it's drizzled with a pork jus made with the magic of wood-smoked Alsace bacon sautéed in butter with shallots. 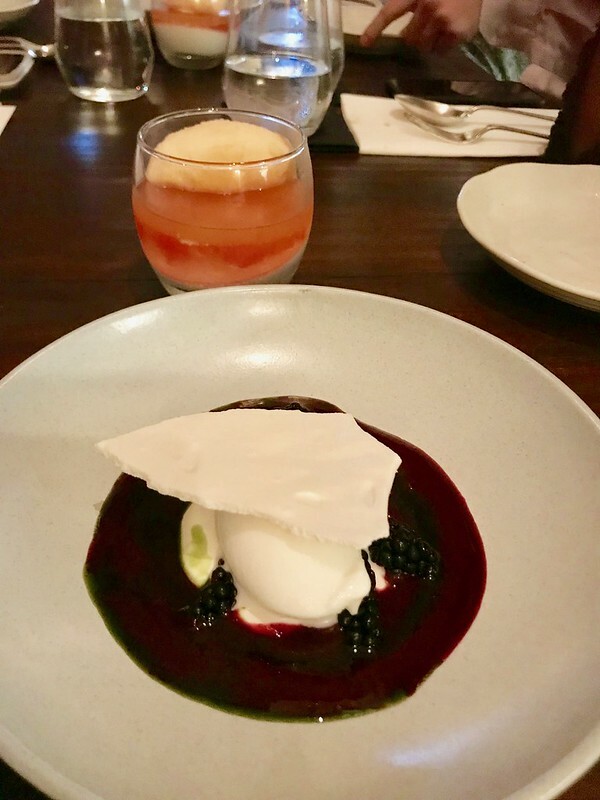 Of the two desserts, I preferred the coconut panna cotta (coconut anything rules, ok?). The prosecco jelly with chopped grapefruit already has its alcohol cooked off, and is topped with a grapefruit sorbet tangy enough to cut through the richness of the coconut. Yogurt sorbet is made in a pacojet with yogurt, lemon zest, cardamon and sugar syrup. This is exceedingly sweet for me, and probably the dish that paled most in comparison to the others. 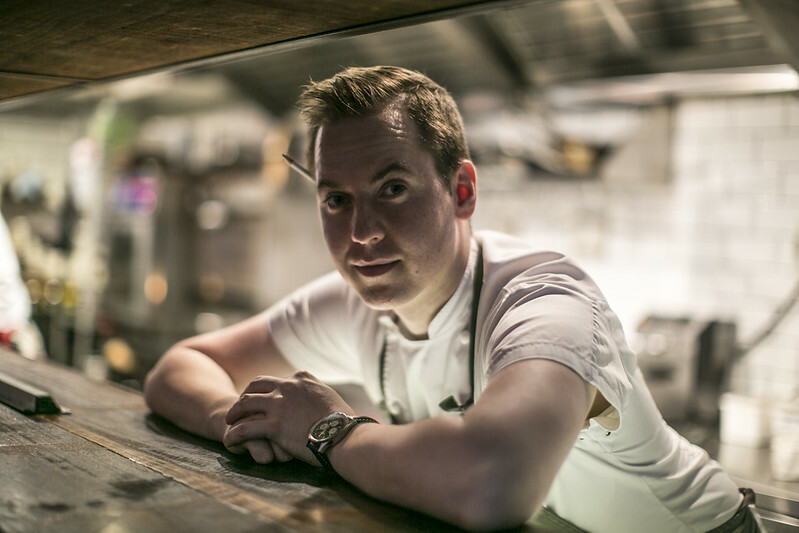 Chef Seumas Smith has been cooking since he was 16. 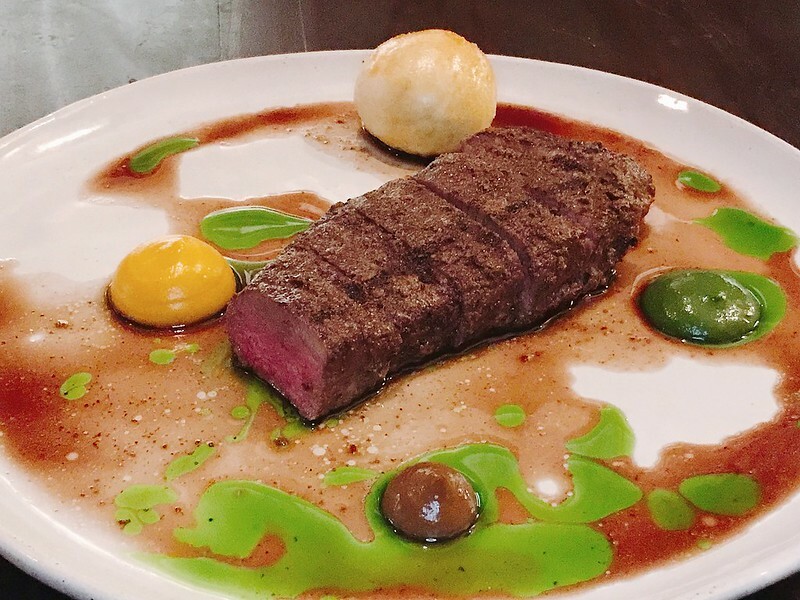 He eventually spent three years with Heston Blumenthal's Dinner by Heston in London before getting his first overseas opportunity at Jason Atherton's Esquina in Singapore. He then moved to Moosehead as Head Chef in 2016. Seumas' style is meticulous, innovative and produce focused. You can see a lot of work going into every dish as most ingredients are made from scratch and responsibly sourced. First and last photo courtesy of Maggie Joan's. Many thanks to the restaurant for the invitation and hospitality.